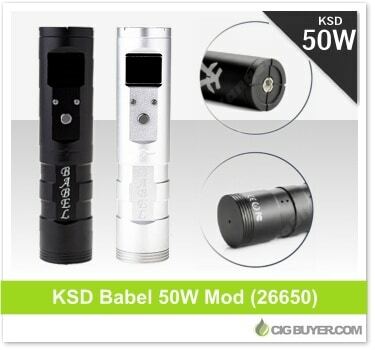 The KSD Babel mod is an attractive, featured-filled tube mod offering up to 50W of output power. Housing a single 26650 battery, it’s quite a handful but offers exceptional capacity and battery life. Firing down to 0.8 ohm, the KSD Babel Mod is “sub-ohm” capable and features a recessed 510 connection with floating brass center pin, along with a large OLED screen that diplays voltage, wattage, resistance, battery level, temperature and puff time.